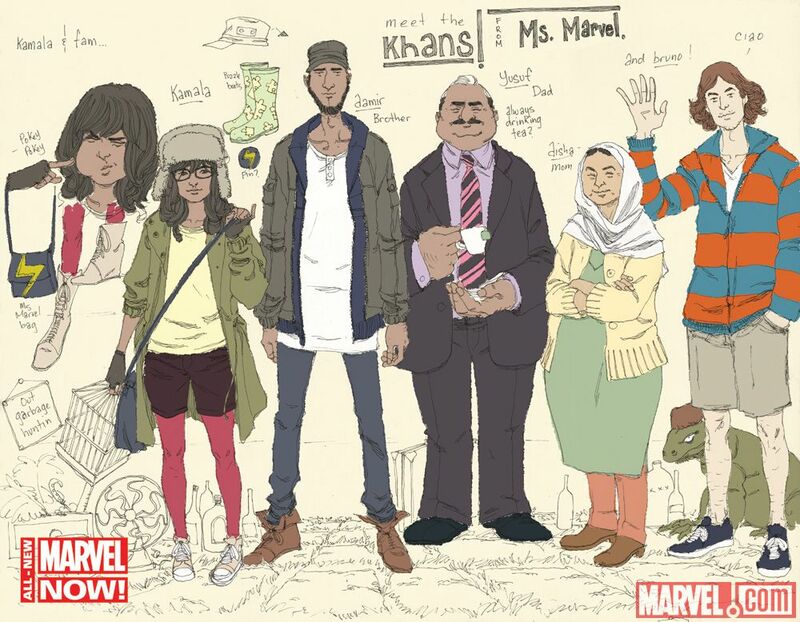 The latest hero to take up the Ms. Marvel mantle is Kamala Khan, a teenage Muslim girl living in Jersey City. Marvel superhero Ms. Marvel, known more mundanely as Carol Danvers, took on the name Captain Marvel in July 2012 in a new ongoing series by writer Kelly Sue DeConnick and artist Dexter Soy. 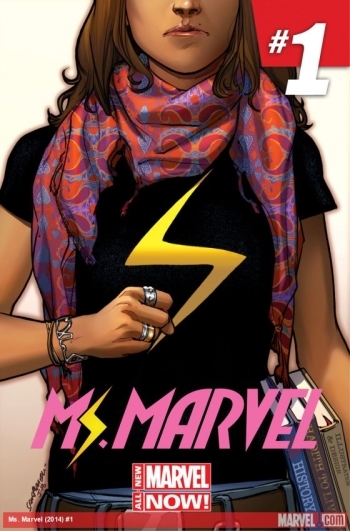 However, the mantle of Ms. Marvel will not remain empty for long. 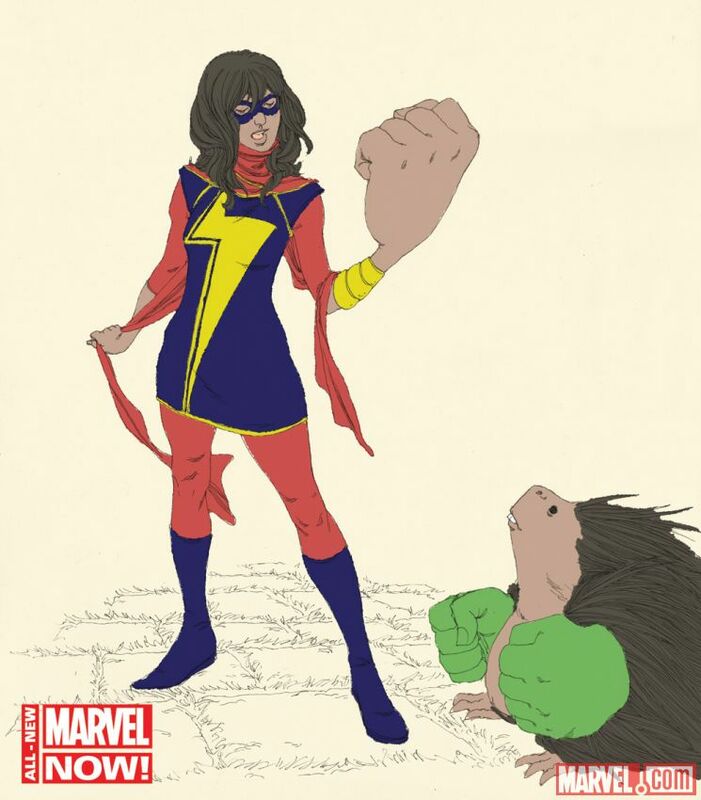 Yesterday, Marvel Comics announced a new standalone Ms. Marvel title coming in February. The lead character will be Kamala Khan, a devoted teenage fan of Danvers who takes on the name Ms. Marvel after discovering body-morphing powers. The young Muslim woman, a Pakistani-American growing up in Jersey City, is Marvel's first Muslim character to get an ongoing solo series. Marvel editors Sana Amanat and Steve Wacker told The New York Times that Khan began in a conversation they had about growing up. Amanat says, "I was telling [Wacker] some crazy anecdote about my childhood, growing up as Muslim-American. He found it hilarious." Series writer G. Willow Wilson, a convert to Islam, was eager to sign on for the title. In an interview with The New York Times, Wilson says that the series is "about the universal experience of all American teenagers, feeling isolated and finding what they are [...] through the lens of being a Muslim-American." An in-depth Q&A with Wilson and Amanat about the new series was posted today by Marvel. Marvel Comics' continuing effort to diversify its heroes includes highlighting female and minority leads in the Mighty Avengers and X-Men series. Female heroes She-Hulk and Elektra will also get solo series next year. An alternative take on Spider-Man this year featured black Hispanic teenager Miles Morales in the iconic costume instead of Peter Parker. Speaking on the success of Morales, Axel Alonso, editor in chief of Marvel Entertainment, tells The New York Times, "When you see Spider-Man strip down his mask and he looks like you, you are more inspired to pick up that book." If you ask me, more people reading comics is always a good thing, and given that DC Comics keeps on putting its foot in its mouth, Marvel is looking pretty good right now.